"Conceived in Wales, squeezed out in England"
Are you tired of the endless streams of (c)rap that passes itself off as music these days? Then try this album on for size. It's glorious, melodic, exciting, roaring... a perfect seamless mix of Celtic Folk and Rock, with spine-tingling electric violins, huge mellow bass-lines, delicious guitars and a drummer who should have been in Led Zeppelin! And of course Lizzie Prendergast's vocals - to die for. From the stunning first track "Mad Tom's Song", through the rock-'n-roll of "Calling Number 5" and "Sleepy Hollow", to the shivers-down-the-spine of "Molly Bond" and "Pentyre Town", and the beautiful acoustic "Child" and "Helen". 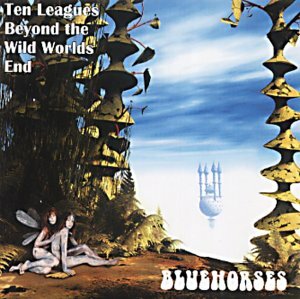 If Wales has an equivalent of Led Zeppelin, then it sure as hell is Blue Horses. And gray gulls gather in Pentyre Town. Flocking in as the sun sinks low. Fill the air as the sun goes down. Love! Come back from the weary sea! Swift and light, as he wavers by. Fair our wandering days shall be!